Castlebar based business Pamex Ltd. has signed an agreement that gives the company exclusive Irish sales and marketing rights for Alflorex®, an important new clinically proven Precision Biotic® product to support digestive health in the Republic of Ireland. 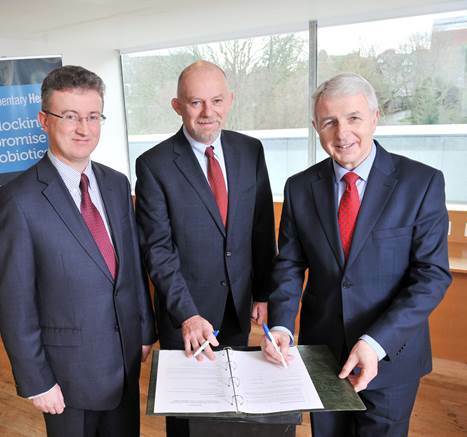 L-R Brian Barrett, CFO Alimentary Health, Dr Barry Kiely CEO, Alimentary Health & Tom Murphy, CEO Pamex Ltd.
With thirty years of experience marketing licenced over-the-counter products and prescription pharmaceutical medicines, Pamex Ltd.'s track record of success makes the company an ideal partner to launch this new Precision Biotic® product, Alflorex®, which Pamex Ltd. will release through Ireland's pharmacy network over the forthcoming weeks. The active culture in Alflorex® - Bifidobacterium infantis 35624 was discovered in Cork, and proved to be effective in studies of patients suffering from abdominal pain, bloating and irregular bowel habits. Speaking about this development Tom Murphy said"
"We are delighted to be working with Alimentary Health, a Global leader in the development of Precision Biotics® for gastrointestinal disorders. This is one of the few Precision Biotic® products for digestive health which has been found to be clinically effective, and has been extensively researched and published in prestigious medical journals including Gastroenterology and The American Journal of Gastroenterology." Alimentary Health has already seen significant commercial success in other markets, as a result of strategic alliances with leading global healthcare players. In 2009 Alimentary Health licenced Bifidobacterium infantis 35624 to Procter & Gamble (P&G) who today market Bifidobacterium infantis 35624 under the brand name Align®, in the United States and Canada. Align® is now the number one Gastroenterologist recommended biotic product in the US.